OCEANSIDE — Oceanside is set to pilot an Earth-friendly trash pickup service beginning May 1. For one month, bulky trash pickup items that can be reused will go to the Goodwill thrift store instead of the landfill. The benefits are multifold. Efforts reduce what goes in the landfill and support Goodwill’s job training efforts by providing the thrift store with sellable goods. The “CurbUp” service was previously piloted for a week last year. Positive results brought the city, Waste Management and Goodwill Industries together for a longer pilot program. 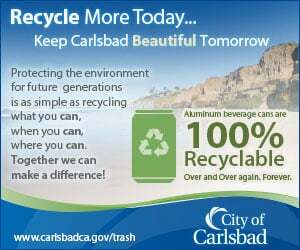 According to Waste Management an average of 15 to 20 tons of bulky items are picked up weekly. Davis said the earlier pilot showed 75 percent of bulky trash items are recoverable. She added part of the pilot is to educate residents on the benefits of extra efforts. Goodwill finds a use for every donated item. Gently used goods are sold at its thrift stores. Items that do not sell are auctioned off in bulk, to be reused or reclaimed. Residents can already call Waste Management to have three bulky item trash pickups for no charge as part of their trash service. Large items are picked up on flatbed trucks on customers’ regular trash day. The “CurbUp” service calls on drivers to cherry-pick gently used furniture that may be reusable, and drive it to the Goodwill thrift store on Mission Avenue. Lori Somers, Waste Management community and municipal relations manager, said trash truck drivers quickly caught on to the new routine during the earlier pilot. Bulky appliances will continue to be scrapped for recyclable metal. Non-useable bulky items will go to the landfill as a last step. Following the one-month pilot, the city/private partners will evaluate, fine tune and likely continue “CurbUp” services. The service will be the first of its kind in San Diego County. Waste Management has a similar partnership with Goodwill Industries in Orange County, but it does not include curbside pickup by the trash company.